In 85% of large US metros, the unemployment rate of women exceeds the unemployment rate of men. 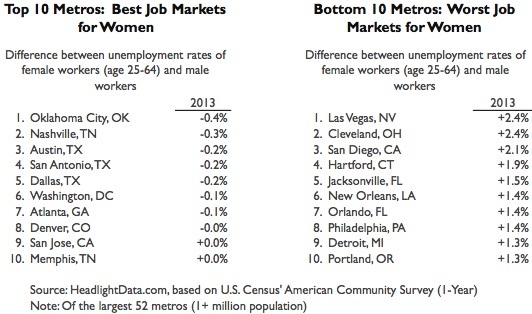 But, data from the US Census shows that 8 of 52 large metros had a lower unemployment rate for women than men in 2013. This unemployment disparity was the lowest in Oklahoma City, where the female unemployment rate was 0.4 percentage points lower than that of men. Nashville, Austin, San Antonio, and Dallas rounded out the top 5 metros. Gender equity is worst in Las Vegas, Cleveland, and San Diego, where the unemployment rate in 2013 was more than 2 percentage points higher for women than men. From 2009-2013, many metros saw this disparity decrease. The largest decrease occurred in Detroit, where the gender difference fell by 3 percentage points. Milwaukee, Portland, Grand Rapids, and Nashville also experienced large declines in the gender gap. 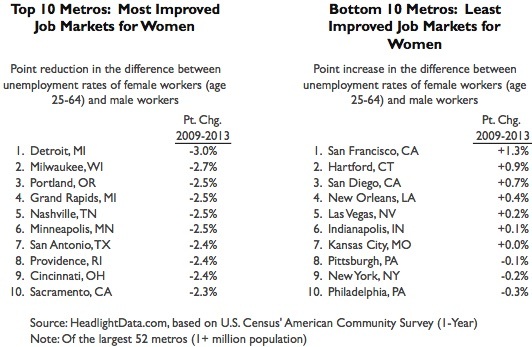 The least improved metro from 2009-2013 was San Francisco, which saw its gender gap increase by 1.3%. Hartford, San Diego, and New Orleans also saw large increases.